The Serviceberry (or sarvicebarry) is a beautiful flowering small tree or large shrub native to Kentucky and appear in other parts US. It is called serviceberry because about the time the fruit comes out, the waters of the creeks are warm enough to be baptized in. The genus Amelanchier, has several varieties. There is the Allegheny, Downy, Shadblow, Shadbush, and several others which all mature to different sizes. It will produce fruit in the month of May after it if flowers, which is in April. They can be harvested and are really good, if you can get them before the birds. 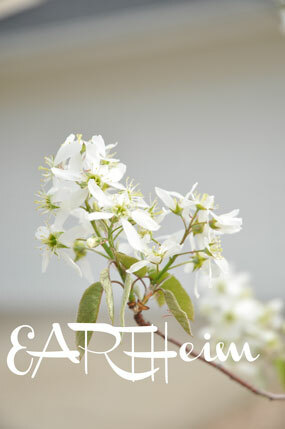 The serviceberry can be pruned at an early age to either be a multi stemmed bush or a tree with a single stalk. In the fall, the serviceberry will have really great color of yellows, oranges and slight reds. There are so many benefits to the serviceberry, I believe we should see more of them across our urban landscape. They are a great replacement for the invasive Bradford Pear. They bloom at the same time and have even prettier flowers, and brighter fall color. And why not have edible fruit too!